Two teams of physicists have stored a single photon of light in an atomic assembly, transferred it to another atomic cloud and then retrieved it again -- all without significantly losing the photon's quantum character. The results are the first demonstration of a simple quantum communication or computation network, which stores and processes information using atoms and photons. Meanwhile, a third research group has shown that a stored atomic state can be transferred to an "entangled" state of light. Conventional computers store and send information as "bits", which can have a value of either 1 or 0. As electronic components become smaller, physicists have suggested that information could be stored and sent in certain two-level quantum systems. These include the horizontal and vertical polarization states of photons, or the "spin up" and "spin down" states of electrons. The crucial difference is that these quantum bits -- or "qubits" -- can exist in both possible states at the same time, a phenomenon known as superposition, which means that a quantum computer could, in principle, outperform a classical computer for certain tasks. Another feature of quantum mechanics is entanglement. This allows particles to have a much closer relationship than is possible in classical physics: if two particles are entangled, we can know the state of one particle by measuring the state of the other. Photons are good candidates for making qubits because they can travel long distances with little decoherence - the transition from quantum to classical behaviour that occurs when the particles interact with their environment. Moreover, they can be stored for long periods. However, for this technology to work, scientists need to be able to manipulate single photons -- a feat that has not been achieved until now. 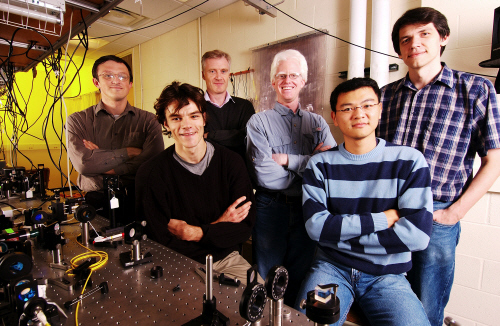 Using lasers and electromagnetic traps, Matthew Eisaman of Harvard University and colleagues, and independently, Alex Kuzmich and co-workers at Georgia Institute of Technology, created a single photon in one atomic ensemble and then sent this photon to another ensemble, where they were able to store and retrieve it. 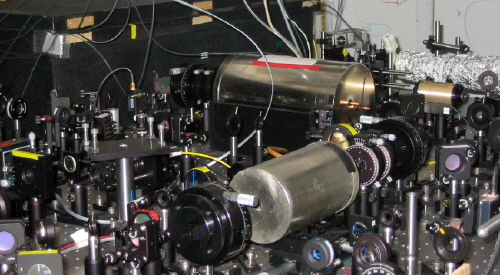 The main difference between the two experiments was that the first employed rubidium-87 atoms at room temperature while the second used atoms of rubidium-85 at ultracold temperatures (Nature 438 837 & 833). The researchers confirmed that the quantum characteristics of the created and the retrieved photon were preserved even after the storage process. "We have essentially created a very primitive quantum network," Eisaman told PhysicsWeb. "Quantum networks are the quantum analogue of classical computing networks and will be an integral part of any future realisations of quantum computing or quantum communication." Other potential applications include quantum cryptography, which allows data to be transmitted with complete security. Finally, Jeff Kimble and colleagues at the California Institute of Technology and Bell Labs demonstrated that a stored atomic state of matter can be transferred to an entangled state of light for the first time (Nature 438 828). These experiments will be important for making scalable quantum communication networks with atomic assemblies.